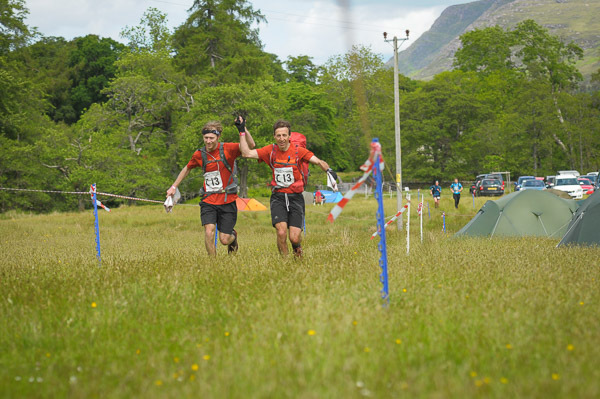 So last night the final unaccounted for team did turn up at 10.30 pm after 15 hours out on the hills, they were Shaun Wilde and Nick Day who were on the Elite course. Despite some foot problems they started again today, but thankfully and sensibly they cut short their course and headed into the finish when they realised they were going to make another unreasonably long day of it. Thanks from all of the marshalls and Mountain Rescue for not keeping us all waiting and guessing. This morning Alan Cameron piped us all awake at 5.45, but some of the lead teams would have already been awake, breakfasted and packed ready for their chasing starts. 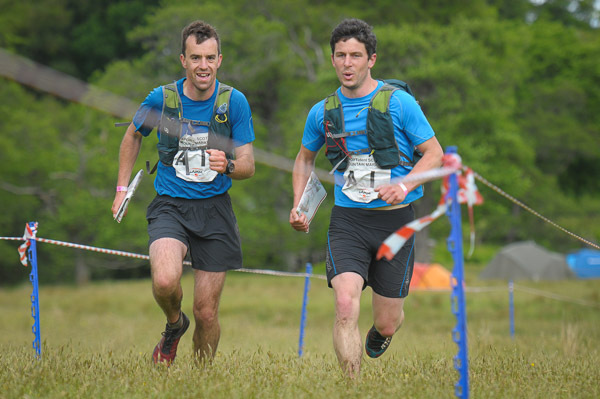 Shane Ohly and Duncan Archer on the elite course had the biggest time buffer at 48 minutes. The tightest race was actually on the D course where Sam and Lesley Gomershall had but a 17 minute start on their chasers. Most importantly of all this morning there was a breeze to keep the midges off and no rain so all in all the start was relatively comfortable for everyone with people sitting outside to do their cooking and eating. As well as leading the D course, Sam Gomersall also had time to do a bit of sketching! 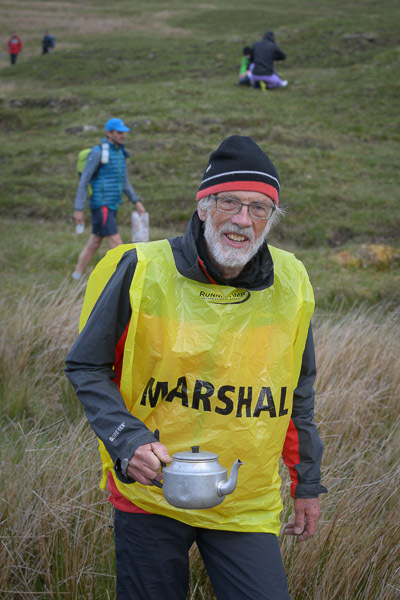 He had brought an old waterproof O map with him and spent half an hour last night making a sketch of the camp site, which he then managed to keep in pristine unfolded condition in order to present it to Martin Stone at the finish. Who’d have thought that the LAMM would be the subject of fan art? Maybe a special prize could be instituted alongside the competitor photo competition (don’t forget to get your entries in). As mentioned earlier the proceeds of beer sales (from the local An Teallach brewery) before and after the event were being donated to Arrochar Mountain Rescue, which regularly provides safety cover for the event. 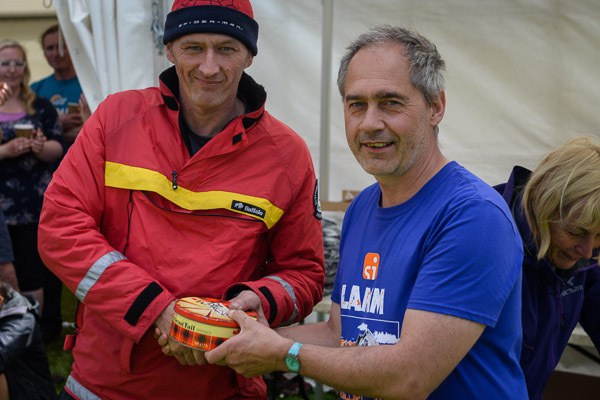 Along with some donations made via collecting tins around the event centre, the total raised came to around £2,100 which was presented to Callum Whiteford, the Mountain Rescue leader, at the prize-giving. Talking of the prize-giving, the prizes this year were presented by Lady Jane Rice, the owner of one of the 10 estates that comprised the event area this year including the field where the event was based. Thanks also go to Inov8 for the bulk of the prizes this year. As well as the prizes for the various courses there were also a number of special prizes including memento generic tubular stretchy headscarves for the six juniors under the age of 18 who took part this time. In the end all of the over-night leaders managed to hang on to their leads and win their categories. 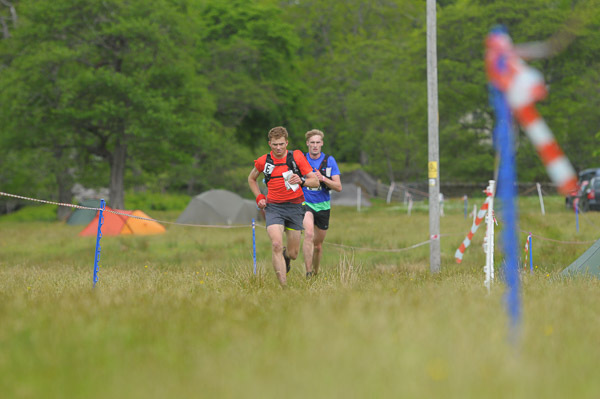 Shane Ohly and Duncan Archer won the elite but equally noteworthy was the performance of Quentin and Zoe Harding, a mixed father and daughter team who won the B course outright. Full results from all the courses are now online. As I write (at 18.17) we are just waiting for one team to finish, but as one of them is a former mountain rescue member there are no concerns about their hill craft, only their sense of how reasonable it is to keep the crew out of the pub.